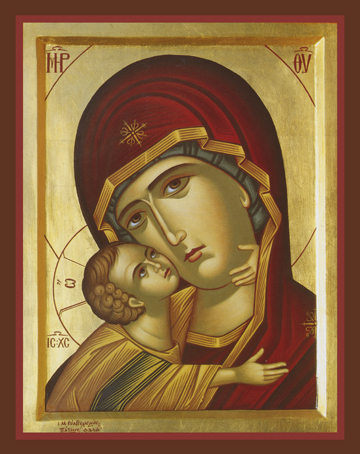 The Virgin Mary bends her head here in a sweet embrace with her Son as their cheeks touch tenderly. His left hand reaches behind her neck and around to her chin and His right hand reaches out towards her shoulder in an intimate and loving embrace, for the Lord loved His mother exceedingly. This is no wonder, for we too have her as a profound example of love, devotion, care, and obedience towards God without limits or merely human considerations. She was faithful to Him as she prayed earnestly in love that the Saviour of all come to save His People even before He was incarnate, served Him during His earthly sojourn, and continued to visit the places sanctified by His life and Passion after He ascended into Heaven. In the Orthodox Church the most common of all responses in the Diving Liturgy or any other liturgical prayer is “Lord, have mercy.” We continually call out, as she did, for Christ to give mercy to us, and He responds to us, as He did to her, by filling us with that mercy which overflows with love. May we greet her, who is in truth the herald and cup of that abundant and tender mercy.